Playing for the first time since Feb. 3, when she crashed to the floor with a season-ending knee injury against North Dakota, Sophia Stiles didn’t waste any time on Thursday night reminding people what was lost that day and what the Lady Griz had been missing in the interim. 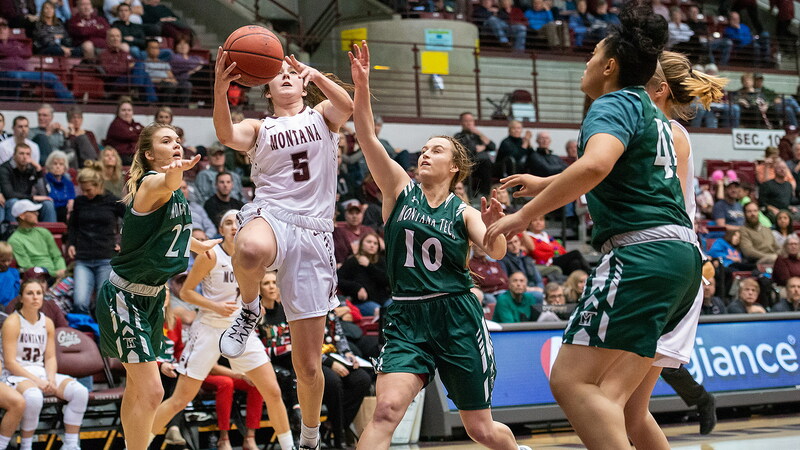 Stiles scored 10 points in just 14 minutes of action and showed her defensive instincts are as spot-on as ever, picking up a game-high four steals, as Montana cruised to an 81-49 victory over Montana Tech in an exhibition game at Dahlberg Arena. You would have thought it was a satisfying start to what may or may not be a comeback this season. For Stiles, it wasn’t good enough. “Usually I’m a pretty good rebounder, and I don’t think I had one tonight,” she said. She had one, but that’s beside the point. She was back and looking good, and now she and Montana’s coaching staff have nine days to decide what to do next. Will she play or will she sit for the rest of the season? “She waited a long time to get back on the court,” said coach Shannon Schweyen. “Whether or not she decides to go this year, we’ve got some decisions to make over the break. Stiles overshadowed, but only by a little, the debut of Sammy Fatkin, who was cleared this week by the NCAA to play this season after transferring from Arizona. She, too, was able to play on Thursday night without it jeopardizing her eligibility. With Fatkin as well, the question will be, will she play this season or will she sit? She finished with seven points, six rebounds and three assists, and looked like she hadn’t picked up an ounce of rust while sitting out Montana’s first nine games this season while her appeal was reviewed. Thirteen players saw the court for Montana — everybody but Madi Schoening and her bum foot — and everyone scored, but it was the same starting five for Schweyen that she used to open both games last weekend at the Husky Classic. That crew was down 8-7 when Montana made a five-player substitution midway through the first quarter, bringing on both Stiles and Fatkin, in addition to Abby Anderson, Katie Mahue and Carmen Gfeller. There was no dropoff. If anything there was an elevated energy level and pace of play, thanks to the insertion of Stiles. She hit her first shot a minute after entering the game and added two assists by quarter’s end. She had two steals in the second quarter in just four minutes played. Ligaments may tear, but some things are just inherent. “I only started (fully) practicing a week ago, so this was a pretty quick first step in seeing where I’m actually at,” added Stiles. “I was definitely nervous, but I thought it flowed really well. I felt good. My instincts were still there. Montana led 18-13 after the first quarter, then doubled up the Orediggers — 10-3 on the season but also using Thursday’s game as an exhibition — in the second quarter, 24-12, to lead 42-25 at the half. The Orediggers made their first two shots of the game and went up 8-7 on Dani Urick’s three-point play midway through the first quarter, but would shoot just 30.4 percent the rest of the game. By game’s end, Montana would force 24 turnovers and finish with 16 steals, with 10 players picking off at least one. “We really worked on being in denial one pass away tonight and putting some pressure on people and picking them up and working them a little bit,” said Schweyen. Eleven players scored in the first half. Kylie Frohlich got on the board in the third quarter, when Montana was going 9 for 15 to really blow the game open, and Lee Camel entered late in the fourth quarter and hit one of two free throws with eight seconds left to complete the box score. Montana shot 50 percent, remained efficient at the 3-point line, going 5 for 11, and had a 44-21 advantage on the boards. Mayhue led Montana with 11 points on 5-of-7 shooting, part of a 53-point effort for the Lady Griz bench. Anderson had five of Montana’s 10 blocks, Gfeller had seven points on 3-of-4 shooting and five rebounds. In six days, Montana will return to the court for practice, in nine the Lady Griz will open their Big Sky Conference schedule at home against Northern Arizona. In between, a time of peace, broken only by one question: What happens next?